Currently, there are not many acoustic guitar collections more distinctive than Fender’s California Series, which takes inspiration from iconic Californian beaches. Today’s featured model, the Newporter Classic, is obviously named after the iconic Newport Beach. When it comes to the Newporter models, the Newporter Classic is the top of the line (the Player and Special versions retail at a lower price), yet it still comes in at a reasonable sub-$1,000 price tag. Worth the cash? Let’s head to Cali and find out! We said it was distinctive and we weren’t lying! There are some very individual features that make the Newporter Classic one very unique guitar. Of course, the first thing you’ll notice is the beautiful colored finish, painted onto both the top of the body and the headstock. This comes in either Cosmic Turquoise, as pictured, or the vibrant Hot Rod Red. Both feature that iconic Strat-style headstock, with a 6-in-line design that always grabs the attention when on an acoustic guitar! The body is bound with a lovey koa, which also makes up the soundhole rosette. Yet it’s more than just a pretty face – the Newporter Classic is fundamentally an awesome guitar. It sports a mid-sized body, roughly the same size as an Auditorium acoustic, which is comfortable for all sizes of player. The build is very commendable, with a solid Sitka spruce top, complemented by solid unpainted mahogany on the back and sides. There is also a solid satin-finished mahogany neck, which is endlessly playable, thanks to Fender’s slim-taper C-shaped profile. This is home to a pau ferro fingerboard and 20 frets, which are easy to get to due to the cutaway. Full marks in this section! Things don’t wane as we check out the hardware – Fender has equipped the Newporter Classic with some top-notch gear. Most notably, the Fishman custom-voiced electronics, which are tended to by a few subtle controls on the top bout. These comprise a bass, middle and treble control, as well as a built-in tuner. Not the most versatile of preamps in this market, but workable. The headstock houses sealed nickel tuning machines, which do a stellar job at holding tunings stable, while there’s a pau ferro ‘Viking’ bridge to match the fretboard, along with a genuine bone nut and saddle. Fender ship this model in a deluxe padded Fender gig bag, which increases the overall sense of value (which was already pretty damn high!). The Newporter Classic doesn’t disappoint in its output. Unplugged, it’s a beautiful sounding guitar, with the mix of solid spruce and mahogany offering nice balance to the tone. It can accommodate fingerstyle playing, but there are much better acoustics in this price range for that, as softer playing on this model feels a little muted. Ultimately, the Newporter Classic shines the brightest when played like an electric guitar – with high-energy strumming! Through the Fishman system, the tone works well – not the most versatile of preamps, as mentioned, but relatively natural in sound for a piezo system. This unique acoustic won’t appeal to players who prefer a more traditional guitar, and fingerstylists are better off looking elsewhere, but Fender’s Newporter Classic is otherwise an essential addition to any shortlist. 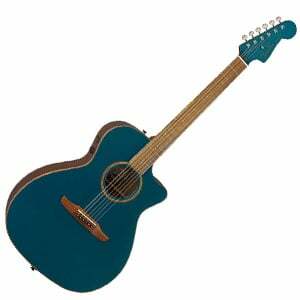 It’s not a cheap acoustic, but for the midrange price it overdelivers on style, playability and quality. For more info about the Fender California Newporter Classic, click here.